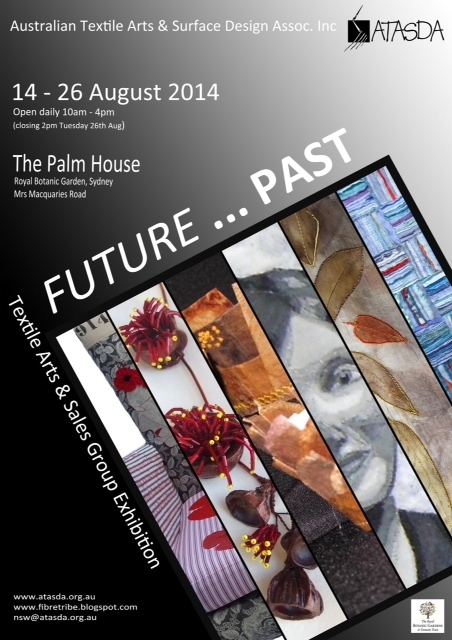 ATASDA Palm House Exhibition – opening tomorrow | Eastwood Patchwork Quilters Inc. Opening tomorrow for 2 weeks is ATASDA’s biennial textile art exhibition. Several memberrs of Eastwood patchwork Quilters are also members of ATASDA and will be exhibiting. It is held daily from 14 to 26th August at the Palm House in the Royal Botanic Gardens, enter from Mrs Macquarie’s Road near the Art Gallery and the Domain. Opening times are from 10am until 4pm. The exhibition features the best of textile art that ATASDA has to show under the theme of FUTURE …PAST. There will be textile art and other textiles for sale.